It has been pointed out in a previous article and I’d like to stress it for a second time: making use of your cell phone, blackberry or even a Google Watch is not the proper way of getting the time for the modern man. 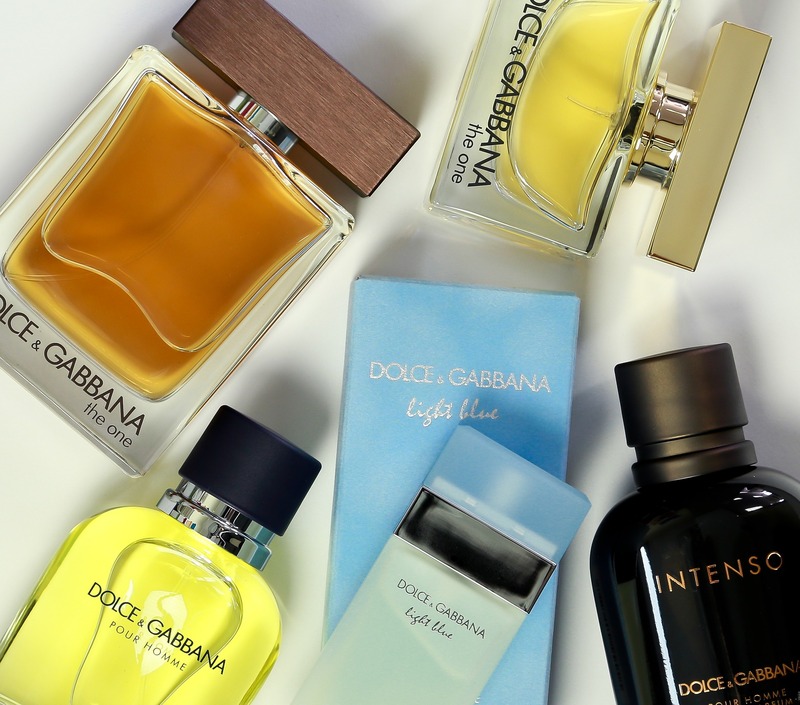 items through which men express style and personality, then wearing a nice wrist watch ist the icing on the cake in expressing your individual looks. Where do you turn to when you are looking for wrist watches for men that are apt for traveling while being stylish and affordable at the same time? The 5 timeless classics in men’s watches we are about to introduce portray style and worldliness while they are not too grand to take the uninevitable scratch from traveling the world without making you lose a fortune. Going from 89€ to 249€ the watches come in a price range that is affordable for any man interested in quality at a reasonable price. Based in worldly Barcelona the Spanish manufacturer Festina has originally been brought into life in the then world capital of watchmaking, Switzerland. After Spanish entrepreneur Miguel Rodríguez had bought Festina in 1902 the company moved to sunny Barcelona where it can now look back on a company history of more than 100 years. With one main and two subdials the Festina stands out through its well-rounded retro look as well as the stylish date display in the upper half of the main dial. The case made of brushed stainless steel as well as the leather wristband make for an overall solid impression. 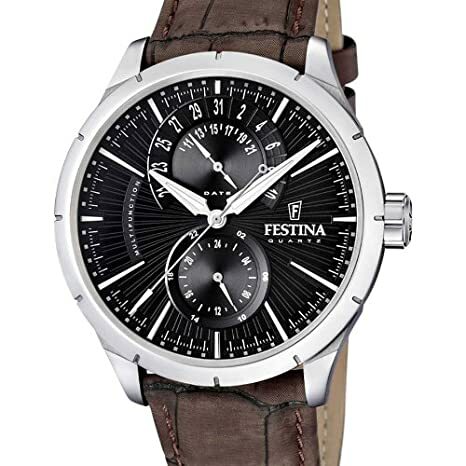 The Festina Classic Multifunction is located in the entry-level section of men’s watches and can be had for an absolutely fair price at any official distributor of Festina watches. The watch might just be had for much less through price comparing websites like Amazon. If there was a perfect term to describe the model named Browned in the Irony series of Swiss manufacturer Swatch then it would be ‘profound’. Mind you that this can be taken quite literally: With its clockwork set in a stable and heavy frame the Swatch Irony Browned comes with a certain weight to it that gives it an actual ‘profound’ feeling on your wrist. Similar to the first watch by Festina the Swatch Irony Browned also features more than one dial. A total of three sub dials allow the measurement 60 minute, 60 second as well as 1/10th of a second intervals. The watch’s three o’clock position is replaces by a display of the day of the month. While looking similar to the Festina the Swatch Irony as a slight advantage in terms of elegance. The clockwork is attached to the wristband by three almost invisible eyelets which makes for a beautifully looking seamless transition between the two. Created in 2013 this timeless classic in men’s watches is available at your local Swatch store or at Amazon. 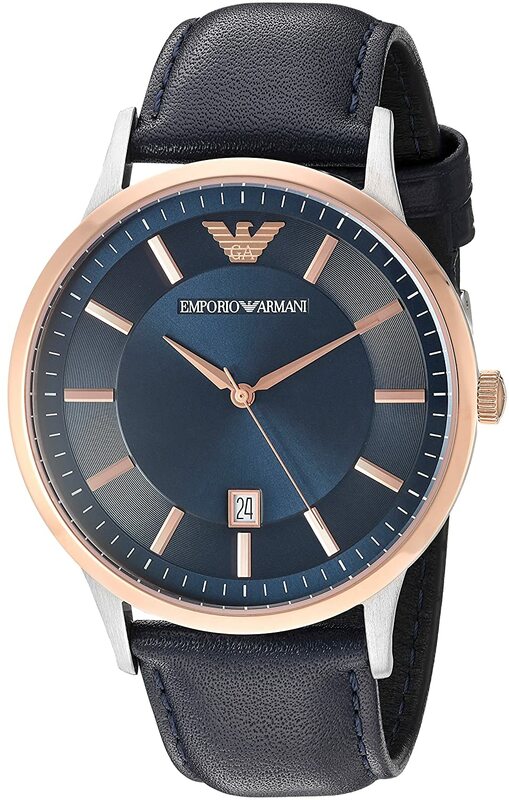 Giorgio Armani is not only renowned for being one of the most distinguished creator of some of the best perfumes for men, his clothing and accessoire line of Emporio Armani also features men’s watches that are quite noteworthy. With a diameter of 42mm the model named Renato is about as big as the two previous watches by Festina and Swatch, albeit with one difference. Armani’s watch is slightly thinner and thus lighter than the previous models which allows for a more subtle and sophisticated look. dial to the date display at the bottom. The invisible axis from north to south adds to the slim and light look and feel of this highly elegant timepiece for men. The Renato can be considered a more advanced model in our hand-selected list of recommendable watches for men. Bouncing back and forth from being sold out due to high demand the watch prices in at $195 (~180€) at the official Armani online store watches (free shipping and returns on all orders) or on any other major shopping website such as Amazon. The design manufacturer Skagen Designs with their brandname of Skagen Denmark has its headquarters in the Unites States, but originated from the area around beautiful Copenhagen. A design company by trade Skagen Design also produces accessoires and features like handbags and jewelry. Design-wise the company stands in the tradition of Scandinavian minimalism, a fact that finds its most striking resemblence in their line of men’s watches. Here, models like Ancher stand out by their ultra slim design that practically wraps itself around your wrist as if it was custom-made to do so. With a thickness of only 8mm the watch is an easy-to-wear featherweight that comes in a timeless, yet masculine design. 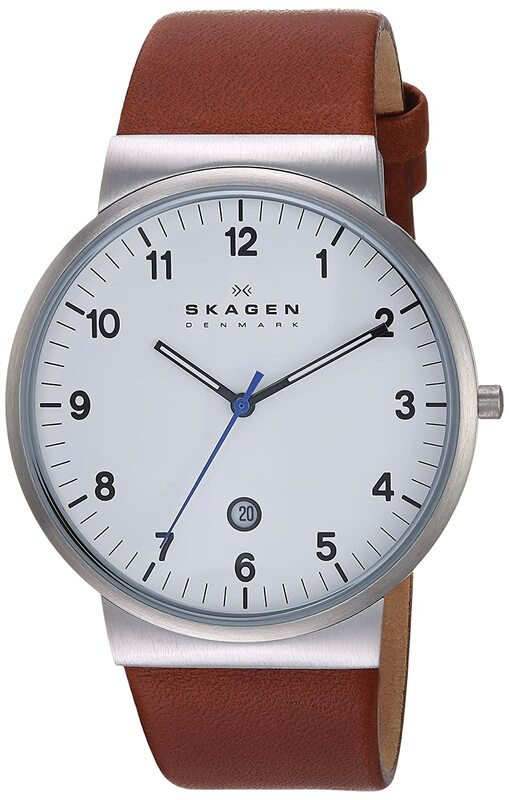 Surprisingly for a watch of such looks and quality the Skagen Denmark Ancher comes at the highly affordable price of only 129,90€ if you decide to purchase it through the German Amazon website (it is sold out on the other country-specific Amazon sites). Admmittedly, it can be argued that the Junhans Meister Chronoscope does not really fall under the category of ‘affordable’ watches. One thing that will hardly ever evoke an argument is the undoubtedly elegant look the classic timepiece in Junghans’ Meister line that reaches back to the year 1936. Established in 1861 the German company of Junghans has been delivering high-class watches ever since. Today the Junghans portfolio closes the gap between watches in the elaborated mid- to high-price segment and the established luxury brands of Maurice Lacroix, Tag Heuer, Breitling and the likes. 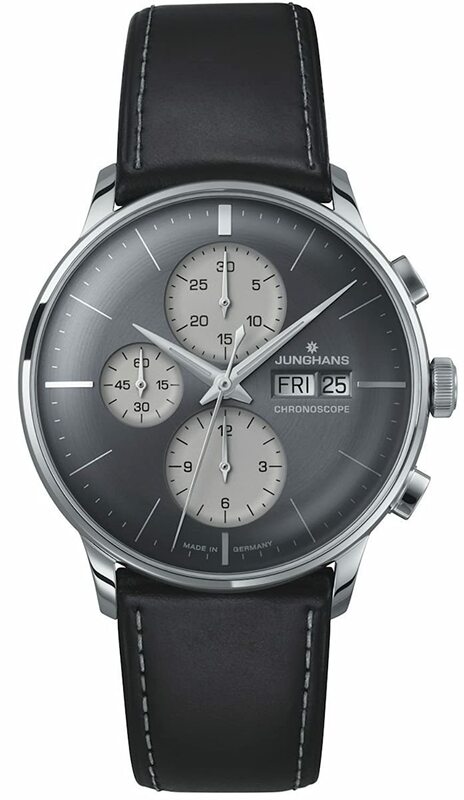 With measurements that go slightly below the average 42mm in case diameter, hte Junghans Meister Chronoscope can be seen as the perfect blend of the ‘profound’ aforementioned watches and the Skagen Ancher as a quasi-sports watch for men: While the Danish-built ultra slim watch measures only 8mm in thickness, the Junghans Meister is only 4mm above that ultra slim built. Not exactly a bargain at 1700,00€ the Junghans Meister is a convicing watch for the worldly gentleman. Comparing prices may save you some money.